William Swoboda was Racine’s only Socialist mayor, who was eventually thrown out of the Socialist party. William J. Swoboda was born in Racine and went to school here. In 1916 he enlisted in the U. S. Army and served with Wisconsin’s distinguished Thirty-second Division, “The Red Arrow Division,” during the First World War. 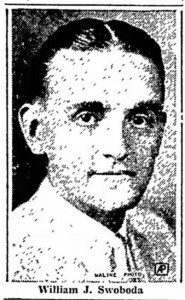 On Friday, May 13, 1912 – his “lucky day” as he called it – Swoboda married Esther Smith (1898-1975), also a native of Racine. In 1931, when he was not yet 34, he was elected mayor of Racine. Swoboda was Racine’s only Socialist mayor. He served during the time in the 1930’s when Racine was known as “Little Moscow”. That infamous nickname was earned by a city beset with labor unrest and strikes during the Great Depression. The kidnapping and beating of an erstwhile Communist sympathizer named Sam Herman occurring, as it did, during Socialist Swoboda’s mayoral term, only deepened the perception that Racine was a “hotbed” of liberal discontent. However, when Herman ran for mayor of Racine, he garnered only some two hundred votes, the most pro-Communist votes ever tallied in the community at any time. Swoboda was eventually either expelled or forced to resign from the Socialist Party, which viewed him as weak and ineffective when it came to its beliefs and purposes. Local moderates and conservatives labeled him a “radical” and a “crook”, who had taken bribes for allowing slot machines into the city. That distinction of being the only person in Racine ever to have spent a night in jail while serving as mayor, coupled with his driving about in an anonymously-donated new car, Swoboda’s political fortunes waned. In 1937 he was defeated by the conservative Ray A. Spencer, the retired Western Publishing present who, ironically, had helped the then-Socialist E. H. Wadewitz found that business. In fairness to Swoboda’s years of service as mayor, it should be remembered that he did contribute a great deal toward the alleviation of suffering among local people who were poverty stricken by the Great Depression. The Socialists Discharge a Mayor. Racine, Wisconsin’s second city, a town of sound Republican antecedents, a year ago somewhat hilariously elected as mayor a young man without political, business, economic, or social experience. He bore the Socialist label, then almost unknown in Racine, but was elected largely by supporters of the former mayor who had been beaten in the primary. His friends rallied around the unknown Socialist candidate mainly as a rebuke to those who had voted against their favorite. Today Racine finds that it not only elected the Socialist mayor but that it placed the state Socialist executive committee, a little group of Milwaukee officeholders, in final authority over its affairs. This has become definitely clear with the announcement by the committee that the mayor, William Swoboda, has been expelled from the party on charges of gross official misconduct and given an ultimatum allowing him 10 days to resign on pain of public exposure and threatened grand Jury action. The mayor, on his part, anticipated the action by minutes. He announced his resignation from the party, declaring that its rule over him was intolerable and contrary to good public interest. An ugly current of rumors, some emanating from the committee and some from the mayor, involves him in charges of negotiating with Chicago gamblers, contrary to the interests of the local fraternity and menacing the good name of the Socialists. Without regard at present to the truth or falsity of these charges, or the fitness of Swoboda to be mayor, the action of the committee reveals a source of great danger to the community which elects as its chief executive one who admits accountability to any other than the people who elect him and the office he serves. With Swoboda’s election it became apparent his policies were those of the Socialist committee of which William Coleman, secretary; Mayor Dan Hoan, and Sheriff Al Benson, all of Milwaukee, were dominating factors. His speeches were reminiscent of those written and delivered by Hoan. Racine, the old timers said, was being governed from Milwaukee. Now the mayor, having failed to give satisfaction, is to be expelled from his party and must resign his office. The Socialist party, with mayors in Wisconsin’s first two cities, has too much at stake to be endangered by a weak or recalcitrant mayor. The city of Racine, not the Socialist committee nor the young mayor, is the party most concerned in this controversy. Its interests are paramount. The committee threatens the mayor with the grand jury. A grand jury should be called, but it should be called by the citizens. Whether the mayor resigns in 10 days or not should have nothing to do with it. The Socialist executives should be compelled to tell what they mean by gross official misconduct. The mayor should be made to tell of his loans and any relations with the gamblers he has talked about. The committee should have to tell by what right they demand the resignation of an elected official of a neighboring city and to what extent they influenced his political and public actions.